Drug free. Instantly open your nasal passages. Can be used day or night. Fits 75% of adult noses for S/M strips. Larger size strips available for adults with larger nose. 9/10 people said that they could breathe better instantly. 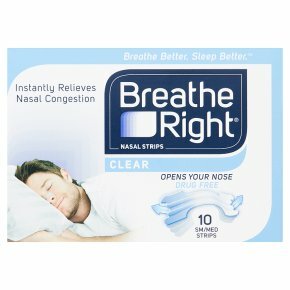 Opens your nasal passages so you can get a more restful night's sleep.Drug free Breathe Right nasal strips are clinically proven to instantly open your nasal passages so you can breathe easier. Breathe Right nasal strips are flexible spring-like bands to gently lift and open nasal passages to allow better airflow. Breathe Right strips can be used day or night for relief from stuffiness due to allergies and colds. The size you choose is important; use the right size for best results. Keep out of the reach of children.<br><br>CAUTIONS: Do not use if allergic to latex or to Breathe Right nasal strips. Do not use over sores, sunburned or irritated skin. Do not use more than 12 hours per day. Not for use in children under 5 years of age.<br>Packaging of this product contains natural rubber latex which may cause allergic reactions. If rash or skin irritation occurs, discontinue use. If you suffer from sleep apnoea, consult your doctor.<br>Disposable - use each strip only once. For external use only.